Happy Sunday, Stampers! By now you know that Sunday is the day for a new challenge from The Paper Players, but alas, my time with them as a guest designer is almost at an end. I'll miss being part of the design team, thought I'll still be playing along with their challenges. This week the uber-talented Nance Leedy has a sketch for us to play along with. I think I love sketch challenges the best. Most of the design work is already done for you! 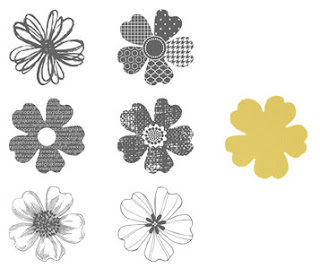 I thought this layout was the perfect opportunity for me to ink up my new Flower Shop Stamp Set for the first time. This stamp set coordinates with the Pansy Punch, which is also new. Making cards with coordinating stamps and punches is such a breeze! This card came together in a flash. The flowers were stamped with Bermuda Bay and Strawberry Slush Ink Pads. The designer series paper is Gingham Garden, one that I have been reaching for over and over again lately. The leaves were made using a 1 1/4" Circle Punch and then embossing lightly with a Stylus, a trick my stampin' buddy Justin showed me the other day. Don't forget to visit the rest of the design team at The Paper Players! Thanks for visiting and have an awesome day! Beautiful, Sandy! I love the flowers with their pearl centers. I will miss designing alongside you :( Your work is fabulous! Very Pretty Sandy, as always!! I love this Sandy! It is so cheerful & happy! 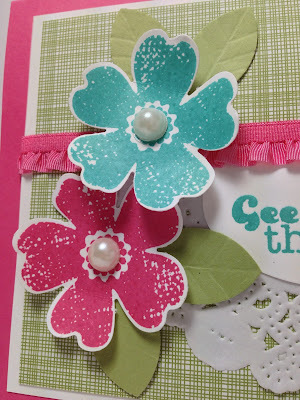 These florals are so versatile and paired with the doily, your card just reminds me of a pretty country scene! I will really miss "playing" with you, so I do hope you keep coming back!!! Sandy, you really rocked my sketch! The flowers are perfect and I love their bright, happy colors. All the elements are perfectly placed and the doily looks just like a country tablecloth--gorgeous! Thank you so much for your dedication to our DT. It has been wonderful stamping alongside of you and I love your work!! Big ((hugs))! A beautiful combination of colors and textures. This DSP in the background is one of my favorites in all the new DSPs. Love what you did with it here. LOVE it! Your use of the doily is perfect and the colors have a wonderful summer feel. Very pretty!